This stereograph (an early form of the 3-D image) showing three Union soldiers with "contraband" was produced and sold by the E. & H. T. Anthony & Co. company of New York sometime between 1861 and 1865. "Contraband" was the term used to describe escaped slaves who fled behind Union Army lines for safety. 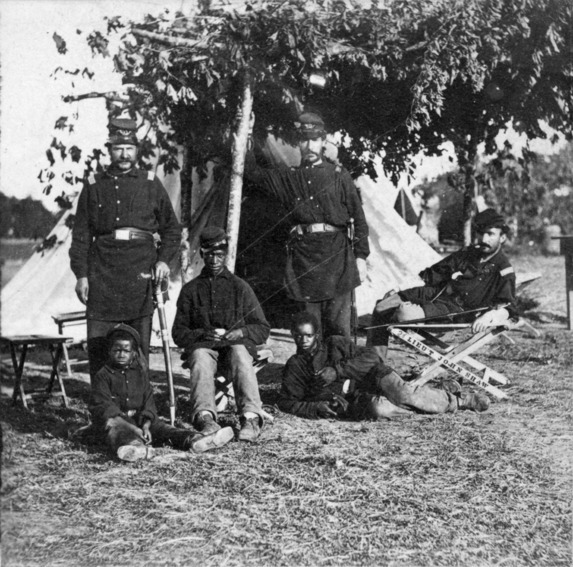 The three young African-American men in the image are clad partially in Union Army uniforms, suggesting that they may have been pressed into service as servants or cooks, as were many so-called "contraband" slaves. For many Union soldiers, their encounters with escaped slaves gave them the opportunity to witness the realities of slavery for the first time. For the northern public, stereograph images of Union soldiers at the front, such as this one, were a way to see the war firsthand. Source | "Contraband foreground," black and white stereoscopic image (photograph) (New York: E. & H.T. Anthony & Co., c. 1861-1865); from Library of Congress, Prints & Photographs Division,	http://loc.gov/pictures/item/97504709. Creator | E. & H.T. Anthony & Co. Cite This document | E. & H.T. Anthony & Co., “A Souvenir Photograph Shows Civil War "Contraband",” HERB: Resources for Teachers, accessed April 23, 2019, https://herb.ashp.cuny.edu/items/show/1066.